Carly, Sam, Freddie and Spencer go to Japan for the "iWeb Awards." After an extremely dangerous plane ride that Spencer set them up on, they get to their hotel in Tokyo, Japan. When Carly and Sam show interest in the same boy, they vow to not let him come between them. This turns out to be more difficult than they imagined and soon their friendship is tested as they compete for his attention. Sam is insulted when Freddie accuses her of not paying him and Carly back any of the money she’s constantly borrowing. Sam tries everything she can think of to pay them back – even getting an actual job. A "Messing With Lewbert" sketch goes horribly awry, injuring Carly’s obnoxious doorman. The gang nurses him back to health until Freddie’s mother steps in and takes over. When a romance starts to blossom they have to stop it. When Carly, Sam, and Spencer bring Freddie to their favorite pie shop, they learn that its proprietor has passed away. Worse more, it appears that his recipes may be lost forever. In an attempt to spice up the Christmas tradition with an unconventional tree, Spencer accidentally sets fire to all of Carly's presents. Distraught, she wishes that she had a normal brother. Sam overhears Freddie confess to Carly that he's never kissed a girl, then exposes his secret on the webshow. Gibby and Carly train Spencer for a tryout with the local professional football team. The gang runs a contest on iCarly -- the prize is a new car courtesy of a local dealership. After Nevel wins, the kids discover that the dealership had no knowledge of the contest or the free car they were supposedly donating. Freddie says on the air that he is not a fan of internet sensation Fred, causing Fred to announce the end of his videos forever. Fans are infuriated that Freddie has caused an end to the popular videos. When Carly, Sam, and Freddie sneak out to go to an MMA fight, they get look-alikes to trick Spencer into thinking they’re still at home. Meanwhile, Spencer builds a gigantic version of Newton Balls. When Carly, Sam, and Freddie get an assignment at school to create an original project that benefits the environment, Carly ends up building an illegal nuclear-powered generator! When Carly, Sam, and Freddie urge the iCarly fans to vote David Archuleta to victory on America Sings, they feel bad for the runner-up and help him make a music video. Meanwhile, Sam teaches Spencer how to lie like a pro. When Sam admits she has a crush on a boy at school, Carly teaches Sam how to entice him by acting more girly. Meanwhile, Spencer is convinced that a girl likes him because of his tuxedo, so he starts wearing it all the time. When Carly dates a bad boy, she tries to keep their relationship a secret from Spencer. Meanwhile, Sam pays Freddie to build her a website posting all her favorite gross-out videos. When Carly’s old friend Missy moves back to Seattle, Sam believes Missy is trying to replace her as Carly’s best friend. When Carly, Sam, and Freddie lose the iCarly URL to Nevel, he demands Carly kiss him if she wants their URL back. Meanwhile, Spencer has fun with the two hundred pillows he accidentally ordered. When Sam and Freddie both win a contest for the best locker in school, they are forced to share the same locker. Meanwhile, Carly asks Spencer to give her art lessons. Carly jokes about being able to beat up Shelby Marx, a tough female boxer, on her webshow. Shelby takes it the wrong way and now Carly must fight her. Meanwhile, Spencer is taking allergy pills and must face bad side effects. Carly, Sam, and Freddie present iCarly Awards for best user-generated content, giving the awards to the winners live on the web show. Spencer enlists European swimsuit models to help him make the awards statuettes. Freddie tries to prove that Melanie, Sam’s twin sister, is just Sam in disguise. Meanwhile, when Carly tutors Spencer’s nemesis, Chuck, Spencer tries to convince her that Chuck is evil. When Carly discovers that her “bad boy” boyfriend Griffin collects Pee Wee Babies, she must decide if she can handle dating a guy who has a plush toy collection. Meanwhile, Spencer tries to help Sam get rid of her bad dream. The Dingo channel has apparently been stealing ideas from iCarly, so Carly, Sam, Freddie, and Spencer go to the Dingo studio to give the writers a piece of their mind. When Sam accidentally reveals to Carly that she and Freddie shared a secret kiss, Carly confronts them both about why they never told her about it. Meanwhile, Spencer goes to prison to teach an art class to convicts. When Carly, Sam, and Freddie defeat a famous TV chef in a cooking challenge, the chef gives up cooking, quits his show, and refuses to come out of his bedroom. Spencer tries to make his vision of the future a reality. When Carly, Sam, and Freddie accidentally get Principal Franklin fired, Miss Briggs and Mr. Howard take control and enforce harsh rules. Meanwhile, Spencer hires a grizzled old rodeo star to teach him to ride a mechanical bull. So many boys show up for a "take Carly to the dance contest" that Carly, Sam, and Freddie have to hold a speed-dating session to meet them all. Spencer follows a bizarre workout regimen from a new Pear Phone application. When Carly, Sam, and Freddie agree to make a music video for a pop star's comeback, they discover that the pop star is out of shape and untalented. Meanwhile, Spencer discovers that the woman he is dating is Gibby's mom. When Freddie saves Carly’s life, Carly falls in love with him. Meanwhile, Sam and Spencer compete against each other in a paintball game called Assassin. When the iCarly gang have two up and coming web comedians, Fleck and Dave, on the web show, they learn that the boys’ next video needs to be a big hit. Meanwhile, Spencer wins a boat but can’t afford to put it in the water. In part two, Carly and Sam quickly learn that their fighting is making it very hard to keep doing the web show. 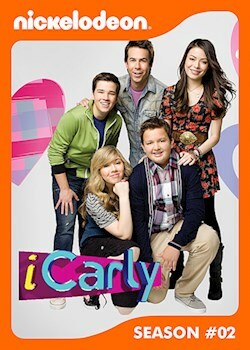 Is this the end of iCarly? Meanwhile, Spencer must defend his boat from an angry college student. Freddie accidentally steals Gibby's girlfriend, and Gibby gets mad. So, he challenges him to a fight, and Freddie figures out that he is an amazing kickboxer. When the gang discovers that Lewbert was once a happy young man engaged to a beautiful woman, they set out to reunite the lost lovers. Sam reveals to Carly and Freddie that she used to compete in pageants as a young girl. When she learns that her long-time rival will be competing in Seattle, she convinces Carly to compete against her. When Sam ends up in jail, Carly and Freddie vow that the web show must go on. They try to enlist Spencer’s help at that last minute but he has a date he can’t cancel. A quirky billionaire asks Carly and her friends to put on the first live Web show from outer space, so they undergo tests for space travel. Meanwhile, a strange little girl visits Spencer at the loft. Bigfoot fever hits Seattle when hikers take some fuzzy footage of a suspicious figure in the woods. After an expert validates the footage on the web show, Carly convinces the gang to take Socko’s RV upstate and join the search. Fed up with his Mom constantly treating him like a baby, Freddie decides to move out into his own place. The gang starts a successful pet photography business. They end up in a feud with a rival pet photo studio. When a heat wave hits Seattle and the power goes out, Spencer comes to the rescue with a Norwegian air conditioner. 16-year-old Nora invites Carly, Freddie and Sam to her birthday party. Near the end of the party, Carly, Sam and Freddie finds themselves in a sticky situation where they must escape from. 16-year-old Nora invites Carly, Freddie and Sam to her birthday party. Near the end of the party, Carly, Sam and Freddie finds themselves in a sticky situation they must escape from. The Cast introduces bloopers and outtakes from the series.